future PC standards thus enabling the use of best available software packages and tools. For communications with the outside world, A2 can use LAN, USB, RS-232 and RS-485, as well as other types of communications, like GSM, Wireless LAN, ZigBee, just to name a few. In order to use natural circulation of air and thus ensure more efficient cooling, all modules and passive backplane have vertical orientation. This is particularly important with Ultra Low Power (ULP) processor modules, which don’t require a fan, and whose reliability is increased with such a cooling solution. A2 is powered by AC voltage between 85V and 265V, with a frequency range from 50 Hz to 60 Hz.Â Thus, this robotic control unit can be used in practically any country in the world. Active PFC allows high energy efficiency and reduced heating of the system. A2 industrial PC design has housing for 4, 8, 12, 14 or 20 ISA slots for modules and expansion. ISA BUS is the only one that supports a passive backplane (without any need for servicing) for up to 20 slots. This is not available for any other BUS, despite newer technology. Aluminum housing with metal top and bottom meshes allows free flow of air and reasonable level of protection from electromagnetic interference and mechanical damage. Vertical design also allows easy access and replacement of the modules from the front side, enabling servicing in the order of minutes. A2 robotic control may be delivered with the latest processor modules such as: Intel Atom, Pentium M, Core2Duo, ULP AMD Geode LX800, and Core i7. Processor module has built-in watch-dog timer, allowing it to work without human supervision. For the operating system and data there is an option between 2.5” hard disk, Compact Flash card, or Solid State Disk (the last two are very useful for high vibration environment). SATA and PATA transfer systems are supported for the disks. From the front side of the module there are 4 USB, 2 PS/2, 2 RS-232, VGA, and LAN connectors and Compact Flash slot available. 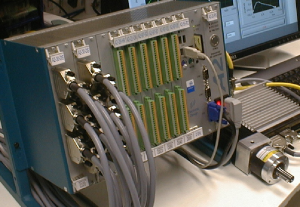 Second RS-232 port can be optionally configured as galvanic isolated RS-422 or RS-485 with extended number of devices on the bus â€“ up to 256 (providing that other devices support the same option). The third major component group for the A2 is Input/Output (I/O) modules. There is a number of A/D, D/A, Digital input and output and Counter modules. All of them are in 188 x 122 mm format with standard ISA edge BUS connector. Analogue input and analogue output modules have instrumentation characteristics with a 12 or 16-bit resolution. On the field side, there are plug-in industrial Phoenix or BNC connectors. All A/D modules have 16 channels, and a number of them have a PGA (Programmable Gain Amplifier). All modules have galvanic isolation as an option. This option isolates controller from the field, and also isolates channels from each other. New modules are modular with micro modules for signal conditioning and isolation. All digital I/O modules have 32 channels over two 20-pin Phoenix connectors. All digital modules are made to work with 24V. For robotic control applications, A2 is typically equipped with modules which use DDS (Direct Digital Synthesis) with 32-bit resolution of frequency range from 0.01 Hz to 10 MHz accompanied with 30-bit counter for position decoding from incremental quadrature encoders up to 6 MHz. One module can simultaneously control up to 6 channels, which allows up to 6 degrees of freedom for the robot. One 19” A2 can support up to 8 modules (48 degrees of freedom). A2 can work with all standard PC operating systems including Windows 95 to Windows 7, Windows CE, Windows Embedded, All versions of Linux and PC UNIX, QNX and others. PC standard allows wide compatibility with all programming tools for PC. By the way, this text has been written and formatted on A2. Drivers for C++, Visual Basic, Lab View and CodeSys are available for all users, as well as test software for the modules. A2 is also equipped with drivers that support the following motion components: Aries (Parker), Soloist (Aerotech), and Danaher’s drives. 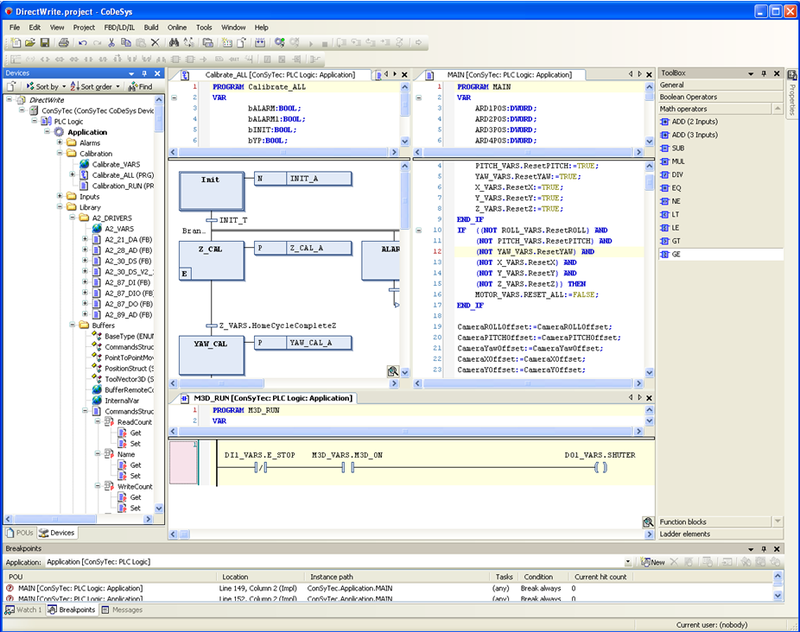 CoDeSys (Controller Development System) is a comprehensive software tool for industrial automation technology. Basically it consists of two parts: the programming system CoDeSys and the runtime system CoDeSys SP. The runtime system turns any A2 into an IEC 61131-3 controller programmable with CoDeSys. Integrated compilers make sure that the program code is processed with optimal speed. CoDeSys offers all editors defined in the IEC 61131-3 standard for application development: Structured Text (ST), Sequential Function Chart (SFC), Continuous Function Chart (CFC), Function Block Diagram (FBD), Ladder Diagram (LD) and Instruction List (IL). All editors were especially designed to ensure optimal handling. Ideas and suggestions from experienced users are incorporated into the development process. Lab View is a programming tool specially designed for measurement and process robotic control. It uses a graphic programming method, allowing beginners in programming to make complex measurement, calculation and feedback using simple icons and wires. Realizing that most users need such an easy to use tool, drivers are readily available for this programming environment.